Did you know that A Modern Day Fairy Tale has been around since 2009!? It's hard to believe it's been that long, and throughout that time, it has grown and changed each and every year, reflecting where my family is at that time in our lives! And throughout the years, there have been some fun posts that are worth taking a look at all over again! So, that's just what I'm doing. On occasion, I'm going to reshare some posts from years past that I think you'll enjoy! Like this recipe I originally posted in 2010! This homemade tomato soup is still one of my absolute favorite recipes to cook for my own family, and perfect for these cold winter days!! I hope you will enjoy making it with your own as well. 1) Melt butter in large soup pot. 2) Add all other ingredients. Bring mixture to a boil. 3) Reduce heat and let simmer for at least an hour. The original recipe called for canned tomatoes with Italian seasoning blended in. I prefer seasoning it myself instead, but this is always an option! You can also try other variations like those with peppers and onions mixed in. Add peppers! I don't know about you, but adding green peppers to near anything makes it even better! So I love adding chopped green peppers to this soup... gives it a little extra something taste wise, and more color and substance too! In addition to the cheese as a garnish, I also love adding a bit of parmesan and/or Romano in as it's cooking as well. 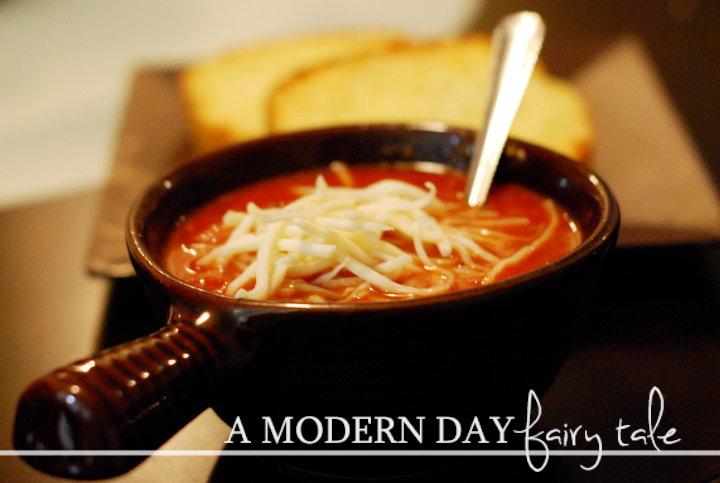 Nothing goes better with tomato soup than grilled cheese, but for this particular soup, I love using mozzarella or provolone for the grilled cheese. A delicious twist on a beloved classic! This sounds so absolutely AMAZING! Tomato Soup is actually a versatile vessel for different ingredients, I too would add in some peppers, some onions, and maybe a little sausage too for a fun addition. Yummy, who KNEW it was so easy and quick to make! Pinning it! Mmmm!!! One of my all time favs is tomato soup and grilled cheese!! I haven't tried it on my own though! !1 I'll have to try this!! This recipe looked so good, I copied it down so I can make it this coming weekend. I thank you so much for the share. Love the sound of this recipe, it seems like it would be so flavorful. I would have it with grilled cheese that has mozzarella and pesto!